I really want to call this a vegan, miso-based “Caesar” salad, but know that the powers of food purism would call this foul. No, it doesn’t have Romaine lettuce nor egg yolk, nor anchovies nor parmesan—but it does have a punchy piquancy that I’d equate with that of the classic dressing we know and love. 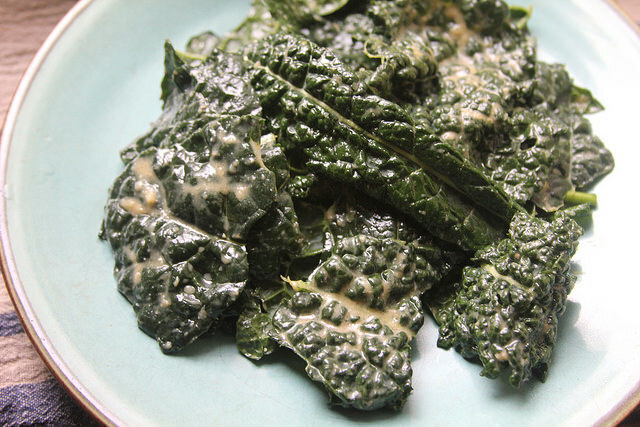 And it was inspired by Caesar (salads, nothing Roman to look at here)—which are nowadays often found with the deeper-green brassica kale in place of lettuce—through its emulsion of garlic, lemon juice and some nice olive oil. I developed a similar salad dressing for a restaurant in Brooklyn once, only instead of miso paste the fermented product was the punchy Chinese black bean garlic sauce. It was a hit all around; but knowing that most people don’t have a crusty-capped jar of black bean sauce in their fridge, went for miso this time around. When it comes to plant-based savoriness, cured and salty fermented beans of some (usually Asian) nature plays a trump card. Gojuchang? Soy sauce? Yep, those are some. Does it play nice with olive oil and lemon, though? I hear the hesitation—but it does just fine. Just try it; it only takes a few seconds to whisk this up and taste. 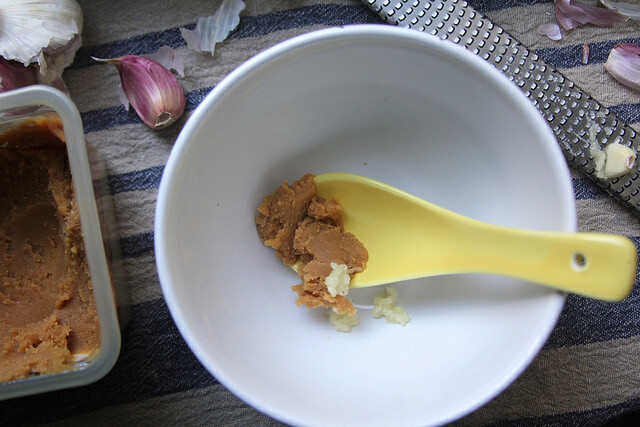 The miso paste even makes up for that thickness you want to see from a Caesar salad dressing, which is traditionally achieved with the richness of egg yolk, with no skill or brisk whisking to speak of. And without anchovies or capers, there is no fine mincing unless you want to mash up your garlic clove with the side of a chef’s knife (which you can certainly do here as well, in lieu of grating with a microplane to get a paste-like consistency). While it’s interesting and informative to learn about the origin of classic dishes, I don’t see the harm in adapting to them given modern ingredients, tastes or preferences. And it’s only a matter of time when this will happen over and over; we’ve already seen mass adoption of kale as a salad green over the last few years—a popularity that might have seemed crazy before. 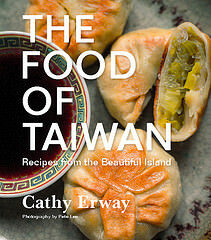 In fact, learning about the origins of “traditional” dishes, you begin to understand how happenstance they were. In the case of Caesar salad, a restaurant low on its supplies decided to make a showy presentation of a salad by tossing it table-side, pretty much on the fly. It wasn’t even that long ago, in the 20th century. In short, it’s good to lean on the tried-and-true. But in your kitchen, anything goes. Remove the thick stems from the kale by holding from the stem and stripping downwards. Break the leaves into bite-size pieces. Whisk the miso paste, grated garlic and lemon juice in a small bowl until smooth. Whisk in the olive oil slowly. Toss the dressing with the salad and serve immediately. Two brownie points: As a side dish, it can satisfy as a healthful complement to a rich meal. Or, you could toss in proteins like chickpeas and hard-boiled egg, chicken or fish, to turn it into one lean meal. 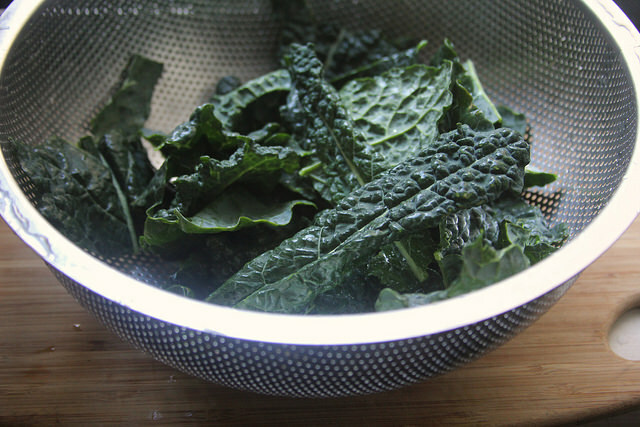 That superstar superfood kale comes with plenty of detoxifying vitamins and minerals, like iron and Vitamin K, and a splash of Vitamin C from the lemon juice and healthful minerals from miso and garlic don’t hurt either. 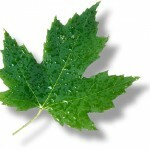 Eight maple leaves: It’s nice to take any fresh, in-season vegetable and whip up a salad using just a few pantry staples. If you have lemons and garlic on hand, it’s tempting and easy to do this anytime, so stock up – and don’t be shy about keeping miso forever in the fridge (it doesn’t go bad!). Great salad. So healthy and delicious looking. Do you think i can add it as a side dish for the steak? I think the lemon will go with the meat very well but i will appreciate your point of view. I would also add a glass of rose. It will be perfect 🙂 Thank you. Sounds like a lovely and simple sauce! Terrific!